Do you know St. Thecla? She was one of St. Paul's disciples. The Romans sentenced her to be eaten by wild beasts but miraculously, the female beasts protected her! Her feast day is celebrated on 23 Sep. This is a custom artwork created specially for St. Thecla Church and School (Clinton, Michigan). 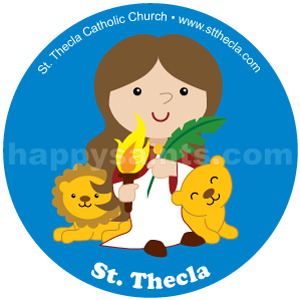 Find out more about St. Thecla here. 40 Printable Happy Saints Flash Cards!